X-Spinner supports all third-party software and allows you to spin unlimited articles with blinding speed, better results and a lower price. And you can even run X-Spinner on a server to provide your own spinning service or integrate it with your software. X-Spinner uses the same spinning core to SpinnerChief that outputs best spinning resutls. X-Spinner Is The Only Spinning API On The Earth That Provides Unlimited Spinning With Super Fast Speed and Low Price! The Lite version is good for basic spinning and will produce some unique content very fast. But the lite version can't deal with simultaneous multi-api queries very well. 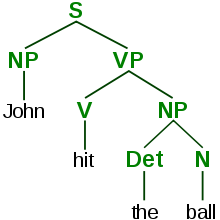 The Pro version is much better, because it has the basic NLP, AI and grammar checker,etc that produce better spinning results and it can deal with more simultaneous api queries. This version is the best for normal users. It can deal with huge simultaneous api queries and give you best spinning results. X-Spinner Supports All Third-Party Software! 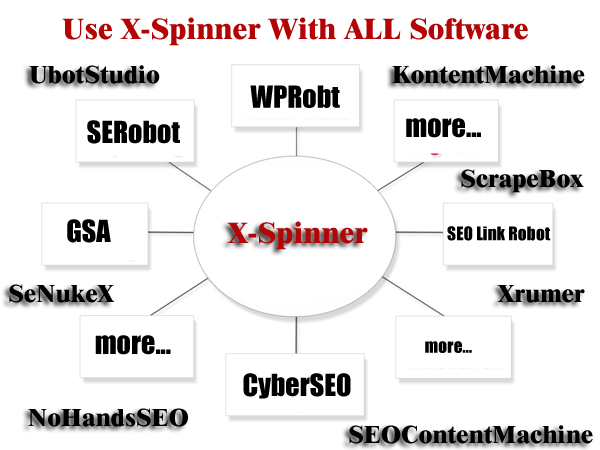 X-Spinner not only has its own api interface, it can also utilize the TBS, WordAI, and SpinRewriter APIs, and that means X-Spinner can be used with all currrently known software. When you use any of the TBS/Wordai/Spinrewriter options in the third-party software, you don't need a TBS/Wordai/Spinrewriter account! X-Spinner Can Generate Readable and Unique New Content for you! X-Spinner can automatically create content that is close to human quality. 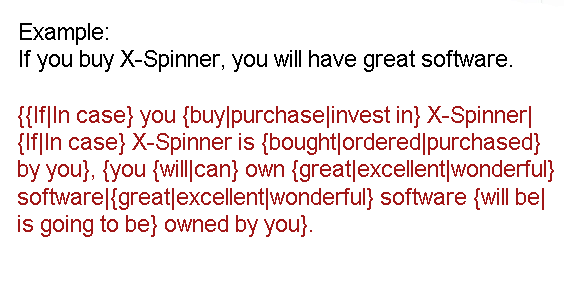 X-Spinner can spin the sentence, paragraph and generate nested spun article fully automatically. By using the latest Natural Language Analysis and Artificial Intelligence techniques, X-Spinner can understand articles and rewrite paragraphs and sentences automatically, and afterwards it can spin agin in word mode to generate nested spun articles if you need them. 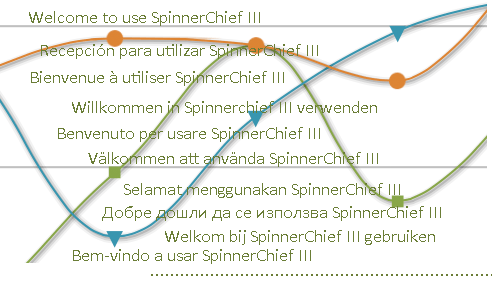 X-Spinner use the same thesaurus of SpinnerChief that is based on Cloud technology, it is created by all SpinnerChief users and it is getting better and better every day. Over 100,000 users contribute their new synonyms to our cloud thesaurus every day; our server collects and finds the best synonyms, then adds them into the Cloud, ready for other users to access. Use our free spin feature to deal with API spinning queries. Use Pro spin's advanced features (Enable Pos, NLP, AI and grammar checker,etc) to deal with api spinning queries and get better spinning results. Use Elite/Super Spin (Enable Statistical Replacement Technology, Artificial Intelligence and Emulated Natural Language methods) to deal with api spinning queries and get the best spinning results. Deal with one API query very fast. Import your own thesaurus to work with API queries. Spin full web pages, protect the html code when you spin. Rewrite articles to a very high level of human readability and uniqueness using The Best Natural Language Analysis and Artificial Intelligence techniques. 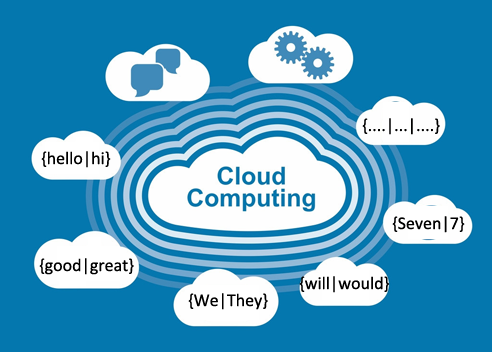 Cloud Negs is another revolutionary feature invented by us for removing bad synonyms. The cloud negs database is based on all users' selections and input too. 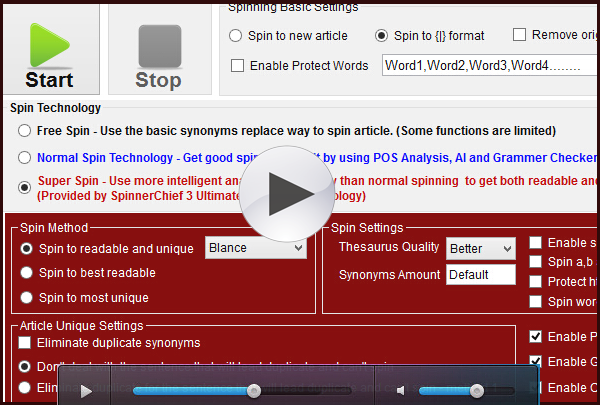 Using this function, the program will use better quality synonyms when spinning your article. We update our software often and you can always get the newest version by using the auto-update. Deal with huge API queries very fast simultaneously. Load all language/thesaurus and spin articles in all languages at the same time. Run X-Spinner on a server to provide spinning service. Customize the listen IP address. Cusomize max online amount and max spin object.